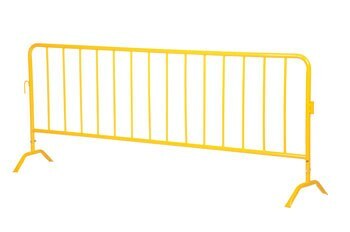 The Light Weight Crowd Control Interlocking Barrier is attractive and the functional design is ideal for directing personnel. Interlocking portable railing has many commercial and industrial applications. Easy to move to meet changing needs. Upright bars are vertically spaced. Each railing includes connectors to attach multiple units together to form long runs. Feet are removable so railing will lay flat for shipping and storage.